If you own mutual funds it means you are going to have to decide what to buy, when to buy and when to sell at some point. This is known as rebalancing. But how do you know when to rebalance your mutual funds? The question comes up often and it’s crucial to address before you even start investing. When and how you rebalance has a direct and significant impact on your results. The best way to approach this topic is to first consider what your overall goals are. For most of us, the goal is to have more retirement income later on. So regardless of which investment strategy you use, it makes sense to have a well-articulated and fully understood criteria to use when you rebalance your funds. Let’s look at 3 different ways people make this decision and determine which model you might want to use. OPTION 1 Rebalance when you feel like it. On the face of it, this may seem like a ridiculous way to manage money. But the reality is, many people use this exact strategy and they don’t even know it. For example, have you ever said any of the following? If you have ever made investment decisions based on statements like these, you are investing based on your feelings. Don’t get me wrong. Your intuition might be right once in a while. But at the end of the day you are investing based solely on your gut. And it’s dangerous to rely on feelings when it comes to the financial future of yourself and your family. I’ll even go one further. Some of the statements above may even seem logical at a given time. But if you notice, every single one is based on one person’s sense of what things mean rather than data and how that data relates to an investment model. Predictions based on observations and feelings are not reliable investment tools. You may get it right once in a while but over the long run, you’ll come out on the short end of the stick. Do you know anyone who “got it right” and sold everything before the crash of 2008? I know plenty of people like that. They were extremely fortunate and/or smart that time. But the problem with most of these people is that they continued to refrain from investing ever since 2008. As a result they missed out on some banner returns ever since. The reason? They invested based on their feelings rather than relying on an investment strategy. They need money from the account. They have more money to invest. Their situation changes dramatically. For example, if you are investing long-term but decide to go buy a home, your long-term investment becomes a short-term investment because you’re going to spend that money. As a result, it would probably make sense to rebalance into a much more conservative portfolio. Buy and hold investors have a system. It’s pretty straight forward but it is a system. To be frank, I’m no fan of buy and hold but I do respect people who use this approach because it is methodical. It has benefits and drawbacks. The benefit is that it is very simple. The chief drawback is that it can subject you to horrendous investment losses. 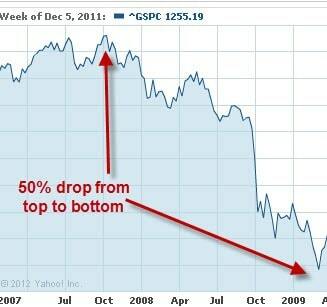 The S&P dropped 38% in 2008. Over the last 100 years, we can observe that there has been a bear market approximately every 3 to 5 years. That’s a spicy tamale and one that not many people have the stomach for. That’s why many investors abandon the buy and hold strategy at the worst time and they become emotional investors from that time on. Look at the first graph below. Can you imagine how difficult it is to hold on? Now, if you look at the graph which shows what happened to the S&P in the months and years after 2008, it seems a bit easier to take. But the issue is, when you are an investor, the only picture you have is the first one. You don’t know what the future holds. Investors don’t have perspective real-time so their fear often takes over. This is my chief complaint with buy and hold investing. But at the end of the day, if you can handle this kind of gut-wrenching investment experience, buy and hold might be a good way to invest. As a result, you may rarely need to rebalance your account. Option 3 Rebalance when the market shifts. This is called “market timing” but not all market timing strategies are alike. Some people “time” their investments based on monthly or quarterly data. Other people use market timing to rebalance every day. Since market timing is such a broad term, it’s impossible to say that it is a good or bad approach. My suggestion is that if you do employ a market timing (or market sensitive) approach you do so in a way that is consistent with your temperament. Also, if you decide to use a certain approach, make sure that method has a good track record. Finally, I always apply the “sleep at night” test to my investing. If I can’t take the worst case scenario and still sleep at night, I know the approach isn’t for me. Ultimately, you should rebalance your portfolio in a way that is consistent with your long-term investment goals and risk profile. In other words, first be clear on your goals then decide on which investment strategy is the best way to accomplish those goals. Once you are clear on these two points, it will be easy to know when to rebalance. How do you rebalance your accounts? Why? What has been the result (good and bad)? Right, I should have explained that (living expenses). I retired back in Jan ’08 and no longer have any earned income. All my living expenses are being funded via my portfolio. Therefore, to get an accurate reading on my portfolio’s performance adding back in the amount drawn for living expenses draws more correct picture. Unfortunately, the cut-n-paste I did of the table lost the formatting, but it still should be clear that I listed both my gross gain (in percentages and real dollars) and my net gain, after accounting for the draws for living expenses. To ignore the amount drawn from the portfolio to fund my retirement would be to understate the portfolio’s performance. Congratulations! Sounds like you are really on top of it JC! Keep up the good work man! I have an ideal diversified portfolio. What’s ideal for me may not be ideal for someone else (which is almost always the case). Through time I’m able to see which one is working well and so I rebalance once in a while. So I’m a combination of Option1 and Option3. One more thing, lately I was almost confused with rebalancing and reallocation. How do you define “rebalancing”? How do you define “reallocation”? What has been the confusion? When it comes to fund investing which is mostly done out of my retirement accounts I’d like to say I’m a market timing guy. My changes are usually driven by what I read and see in the news about the global economy and US sectors and I only make changes two or three times a year max. I am in the buy and hold camp. I don’t need the money for a long time and I only look at my quarterly statements, so I don’t become emotional. The only reason I’d rebalance is if I shifted fund families or if a mutual fund was underperforming. “reason I’d rebalance is if I shifting fund families or if a mutual fund was underperforming” is not rebalancing, it’s re-guessing where the future is going. Rebalancing is moving your asset allocation back to a pre-determined ratio (based upon your risk tolerance profile) by selling your over-acheivers (stocks?) and buying your under-acheivers (bonds?). THAT is the epitome of buying low and selling high. THAT is rebalancing. Market timing is just guessing. JC – thanks for your comment. We disagree. “moving your asset allocation back to a pre-determined ratio” based on a trigger (time) is no different that changing your asset allocation based on a different trigger. Asset allocation might have devolved to a narrow meaning, but when you talk about how to allocate your assets and when to make changes to this allocation, the definition is a bit more broad – at least it is if an advisor really wants to be of service to clients IMO. Changing allocations back to a static % is guessing that returns will revert to their mean – and in an environment with interest rates as low as they are now – that seems a little short-sighted. I also don’t know how you are defining “market timing”. It’s a very broad topic. And many market timers have just as much data to “prove” that their guessing is better than your guessing about asset allocation. So there we are. Anyway, I respect your right to a different opinion. Thanks again. No, the two ‘triggers’ you mention *are* the difference in the two strategies. The rebalancing trigger is based on a combination of calendar (monthly, quarterly, yearly, or whatever you choose) and performance (asset allocation going out of balance). Your ‘trigger’ is based upon perception of future market directon, or, worse, future direction of a particular fund (or stock, if that’s how you fly). Mine is based upon performance of the portfolio. Yours is a guess about the future and mine is a reaction to the facts (how did my portfolio perform during the previous period of time), if it’s out of balance, rebalance. Sell winners (sell high) and buy the loosers (buy low). Tried and true, time tested. Beats market timers (active managers) more than half the time. Actually, my original post was responding to the comment by Brent about dumping losers, “if a mutual fund was underperforming.” That’s not rebalancing. That’s picking different investment vehicles based upon perception of the future. Guessing. Rebalancing is done between asset classes (stocks, bonds, cash) not funds. You don’t ‘dump’ an asset class due to poor performance. You buy more of it because it’s cheaper. And you don’t buy more of an over-performing asset class because it’s been going up. That’s chasing performance and that’s a recipe for an underperforming portfolio. You sell it because that’s ‘selling high’. And you buy the underperforming asset class because that’s buying low. And *that* (rebalancing) is what makes the biggest contribution to the overall performance of a portfolio btw, not the chosen ratio. The chosen ratio only addresses the a particular investor’s risk factor. BTW, choosing an appropriate asset-allocation ratio is not the ‘thing’. That is done to address a person’s risk tolerance. It doesn’t matter if you choose 70/30 or 60/40 or 50/50. Rebalancing is the ‘thing’. It is being out of balance in your chosen asset-allocation that *forces* you to rebalance, thus forcing you to buy low and sell high. That is the winning formula. Not analyzing different fund performances and guessing which way the wind might blow. Thanks. We continue to disagree. The trigger you grasp (time) is arbitrary – as are the allocations you determine are correct. What is sacred about quarterly rebalancing? Nothing. It’s arbitrary. It’s a trigger – that’s it. Moreover, this ignores the current situation. As I said, do you really want to dump all your stocks now and pile into bonds? Don’t get me wrong – this is a very easy approach – just not very profitable. And I’m not sure why you assume that all market timers are the same….you still haven’t really defined it for me. And last, there have been numerous studies that show mutual fund performance has consistency – ie that strong performance often persists for up to 13 months. Read http://www.pensions-institute.org/reports/performance_persistence.pdf Some market timers do indeed guess – but if you look into it you’ll learn that it’s actually the asset allocators you define as the people who guess because they change allocations without any verification. No, of course not. But I would rebalance back to my chosen asset allocation by selling enough stocks (sell high) and buying a corresponding dollar amount of bonds (buy low). Thanks….but I am not sure how living expenses figure in to performance JC? Also, as an advisor, for compliance purposes, I don’t publish performance on my site.